I needed to make a trip to Petsmart and decided to take Aniston along. Aniston and I have created quite a special bond. She’s never been outside of the home since the day I adopted her so I thought it would be nice to get her out and smell some fresh air and feel the sunshine on her fur! (Don’t tell the others, but I think she just might be my fave of the group!) 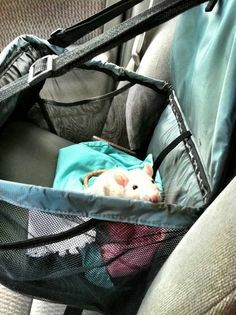 Anyhow, I started with her in my homemade bonding bag, but then saw the dog car seat and had an idea. Let’s put Aniston in it! What a neat plan that was- she had a good time and I was able to focus on the road more. Now, before I get bombarded with emails asking how did I train her to stay in the car sear, well, I didn’t. She is just a pretty well behaved little rat. Which is probably another reason why I like her so much, LOL! As a reward for sitting so nice in the car seat, we stopped through the drive thru of Wendy’s and she got a few licks of my Frosty. You should have seen the look on the drive thru person’s face to see a little beige hooded rat riding shot-gun! I wish I could have taken a photo of THAT! But instead I got some of Aniston in her new car lookout seat… and some more of her driving home. Just kidding!